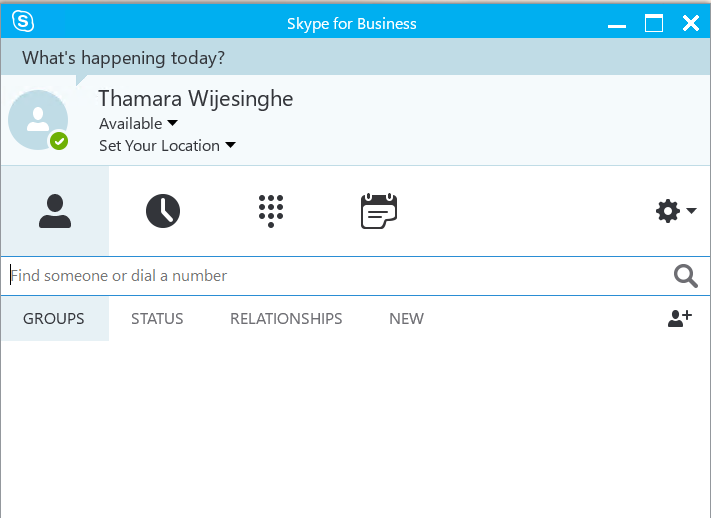 As you all might know by now, Microsoft have started rolling out the Skype for Business client over windows update as well as a standalone update. 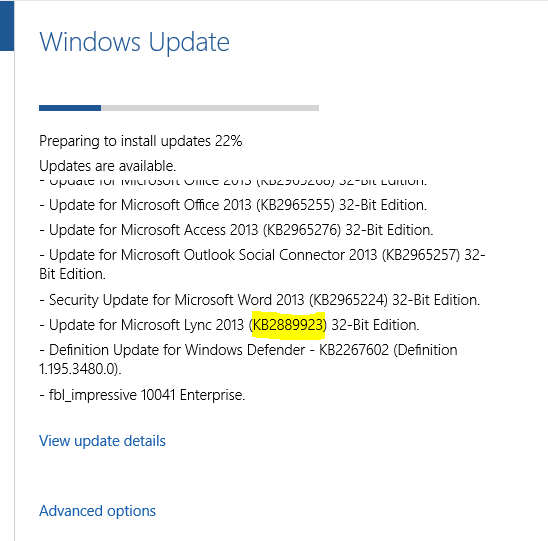 The patch is called KB2889923 and once installed, the client UI can be switched from Lync 2013 in to Skype for business, There are couple of ways to get this update. One is to run windows update on the client PC which will pick the update up from Microsoft. Add the other method is to download the standalone update package and install it on the client. The update can be downloaded from here I took the long path and ran windows update on my PC that picked up the update as expected and updated the client. 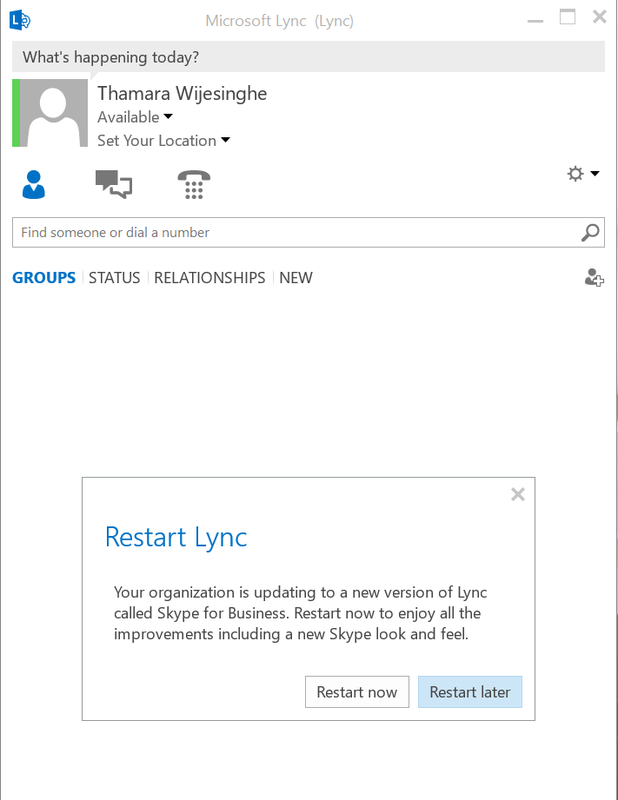 The user account is now enabled to have Skype for Business UI instead of the Lync 2013 client. It will take some time for client to pick up. Once it’s done. It will come up with an alert mentioning that the organization is rolling out Skype for Business and restart the client to enjoy the new features of the Skype for Business client. Upon restarting the client. It will start as the Skype for business client and full features and functionality which designed to be delivered from client end will be available to use despite the fact that the back end server is still Lync Server 2013. That’s all is there to know about rolling out the Skype for Business client within the organization that running with Lync Server 2013 back end servers. It’s all about planning the roll out properly and managing the client policies properly so that it will not end up in a confusion. The same setup is available for O365 Skype for Business (Lync) online. 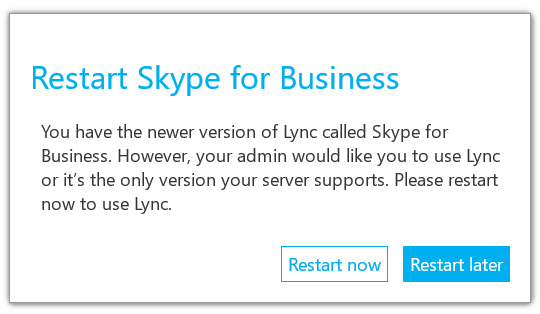 Please use the official Office Blog here which explains how to do the switch over from Lync 2013 to Skype for Business.